I'm using ShareLaTeX on my Chromebook. 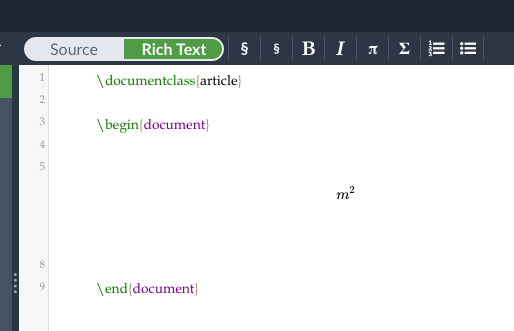 in LaTeX (m^2), but the hat does not come out in the source code, instead it just turns everything into a superscript directly. How can I stop that? Initial question was unclear in respect what was required. it looked like a hat symbol was required, but turns out that a superscript is needed (from the translation by moewe). Not the answer you're looking for? Browse other questions tagged superscripts sharelatex or ask your own question. By default, how much do ^ and _ raise and lower the text box in superscript and subscript respectively? Why is the page turned and how can it be fixed?